In ROBOTILL a cashier is linked to a specific cash drawer (shift). All sales is linked to a specific drawer and cashier. It is also possible to link an additional salesperson to a sale. Cashiers and salespersons are created as Users in ROBOTILL. If you want to link a salesperson to a sale, click on the Menu button and then on 'Salesperson'. A list of all users will be displayed. The cashier can just select the salesperson for the sale. If you want the salesperson to scan/swipe an employee card instead see Users and Login Options. To see what sales a salesperson is linked to go to ROBOTILL Manager > Reports > Retail Specific > 'Sales by Salesperson'. You can also add the salesperson to the till slips in Print Design. In ROBOTILL each cash drawer (shift) is linked to a specific user (cashier). The reason for this is that at the end of the shift someone will need to take responsibility for the actual cash in the drawer. There are however some shops that trust their employees and want to allow multiple cashiers to work on the same till (sharing a till point and cash drawer). You can then use salespersons for this purpose. You can then create a generic 'Cashier' user and each cashier can then be selected before each sale is completed. If you want to do this, it is suggested that you force the cashier to choose a salesperson for each sale. 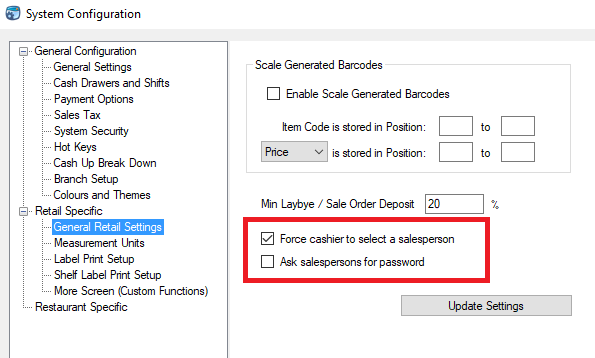 In Manager select Setup > System Configuration > Retail Specific and check 'Force cashier to select salesperson'. You could also choose if you want the salesperson (that will now be the cashier) to enter a password. If you prefer to use employee cards instead you can set that up in Users and Log In Options. The final step would be to replace cashier on the till slip with the salesperson in Print Design (you can leave the description field as 'Cashier'). You will then use the Salesperson report instead of the cashier report to see what each cashier has done (ROBOTILL Manager > Reports > Retail Specific > 'Sales by Salesperson').